I have just needed to read this book ever since it came out. I loved the prior two in the “Old Filth” trilogy and I’ve read others by Gardham – why did I wait so long? Oh well … I’m enjoying now. Once upon a time in dying Imperial England (and this is a VERY British novel) there were three friends, well – friends, lovers, enemies. This trilogy is the story of their lives and loves and hates and deaths as told from varying perspectives. The first one, Old Filth, is from the point of view of Sir Edward Feathers, a retired judge and member of the Temple Bar. The second book, The Man in the Wooden Hat is from the point of view of his wife, Betty Feathers. (I read those many years ago.) The third, Last Friends, is from the point of Sir Terry Veneering, Edward’s nemesis and Betty’s … well … yes. 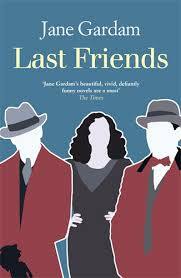 Last Friends starts out with a funeral – this time it’s Edward’s – but the other two, Betty and Terry, have been gone for some time. The book proceeds with the life of Terry – a far, far different tale from that of either Betty or Edward whose stories are completely different from each other and yet very true to the idea of the English Empire. Edward was brought up in Malaysia and England, Betty in a Japanese interment camp and Britain and Terry, from Britain to Canada and back. And there are other players now – Dulcie, a neighbor and Fiscal-Smith, an old co-worker as well as a few minor characters. This is a very intertwined set of stories – beautifully intertwined creating a whole world which is now gone. The trilogy is not chronologically ordered, but the secrets are unveiled more effectively if the books are read as written and it’s possible it makes even more sense if yet another book, The People of Privilege Hill, is read as number three. It’s not really a part of the trilogy because it’s a collection of short stories, but they are about other folks who are players in the trilogy – or neighbors, or associated with that life. I’m reading it next and I kind of regret that it’s falling that way.